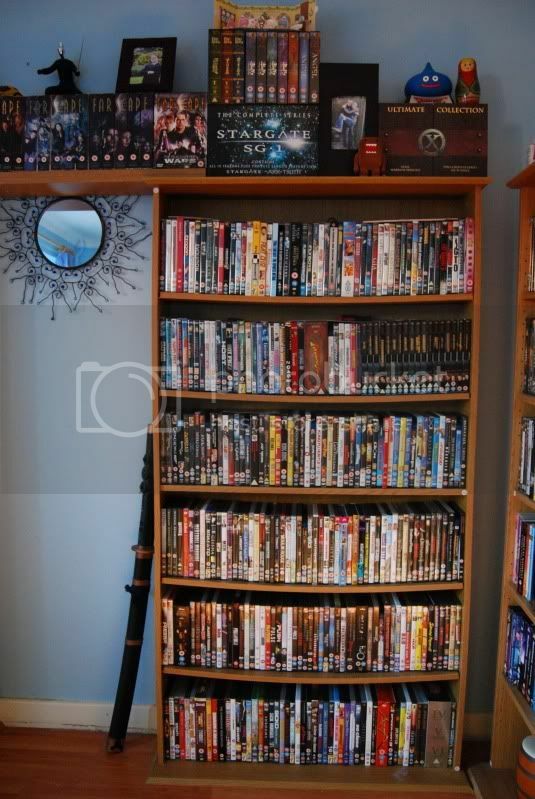 As the title suggests, this is a thread for posting pics of your anime DVD collections, or other anime items in such quantities that you just have to show them off, and so that others may comment on your collection. My whole collection, plus assorted cool stuff that managed to get in shot. Photobucket.com is good I find. 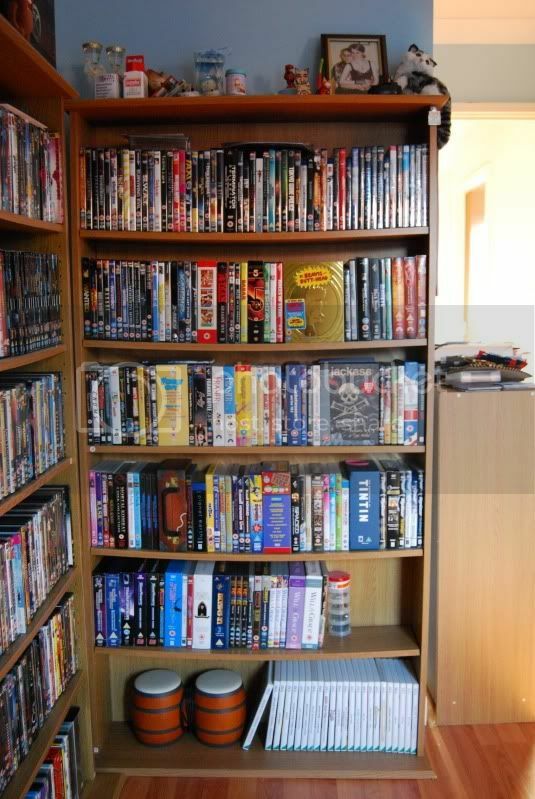 Also admittedly only half of the DVDs there are actually anime. Do you think putting some cases face-forward on the shelves looks good, as I have done with Evangelion, Slayers, One Piece, Naruto Shippuden and a few others? I thought it did anyway, I must admit I am some-what jealous as well. Gah, we have exactly the same Franky. I just noticed after uploading that Sky Blue snuck in there, but I'm not entirely sure if it counts, being Korean rather than Japanese. Also, Robotech. There is a thread on page 6 called 'How do you Otaku-lise your room?'. Should this be merged with it as it covers the same thing. 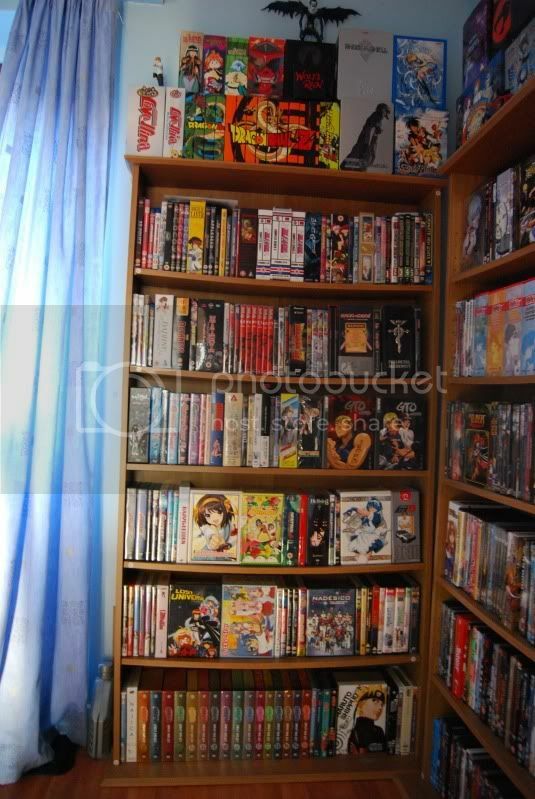 If I every win the lottery I am getting my own house and sorting all my anime out. Here is my meager collection. Great first photo, Mutsumi, was wondering how you were going to get it all into one picture. I need to do some serious reorganizing to get all my stuff into one place. I'm missing complete Trigun (recently sold my old set for the new brick coming out) and Ouran vol 1 + 2 (being borrowed). Why thankyou, ilmaestro. I was able to get it all into one picture only thanks to the fact I have a fisheye lens for my camera. 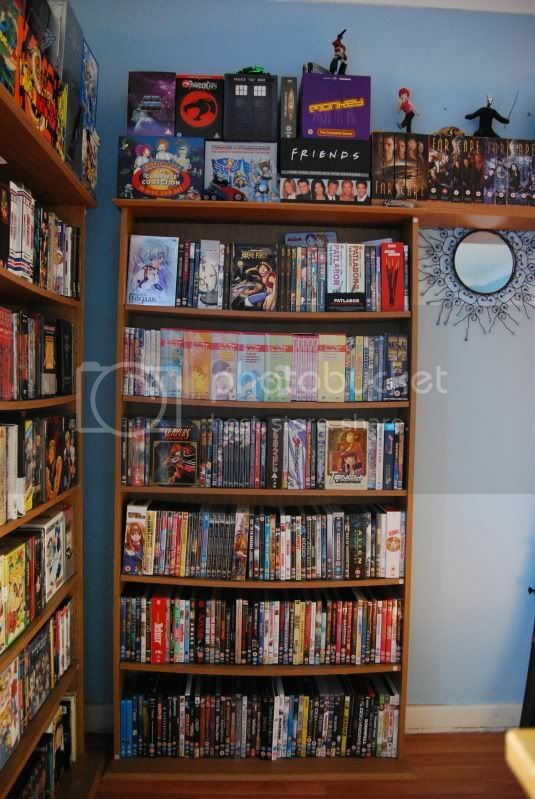 Aya-kun: Thankyou, I only just rearranged my boxsets and made that shelf-bridge between shelves 2 and 3 that day. Hehe thankies, ya its quite a bit all in one smallish space ive filled up 2 books cases before this is my 3rd -and last- as i can't fit a bigger one in there =3. Sadly I can't increase it much more as I only have the one shelf so double-layering it is the only way forwards. That and DVD rental. Am looking on in awe at some of these other collections. Anime karma bonus points if you folks have watched everything in them at least twice!